First international financial platform, combining modern banking technology, the opportunities of the internet of things, big data, blockchain technology, adhering to world-class standards of security and convenience. There are no analogues in the world. 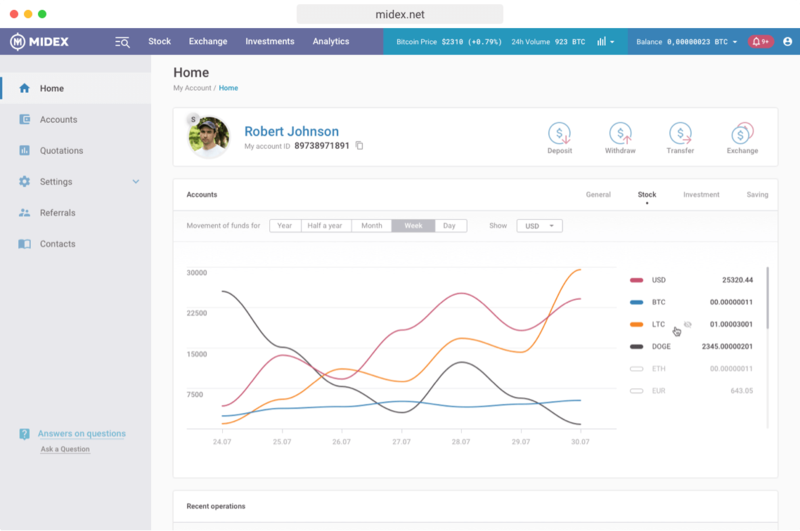 Midex’s instruments and services provide unique solutions on the basis of blockchain, which has no extant analogues in the world and offers revolutionary solutions regarding the consolidation of the world of cryptocurrencies and classical finance systems. The combination of neural networks and smart-contracts controls the majority of processes within the Midex ecosystem, thus eliminating the possibility of mistakes and compromises. Midex Exchange is a round-the-clock service for access to the market of cryptocurrencies, observing all legal norms. Its unquestionable advantages: trade analysis instruments, trading bots, signals of experienced traders, and the ability to strike personal deals with other users. Quick access to assets through internet banking and applications for iOS, Android and Windows Phone. The center for managing your finances, bringing together intuitive design and a modern platform for sending and receiving transfers, charging, exchange operations,accounts and investments. 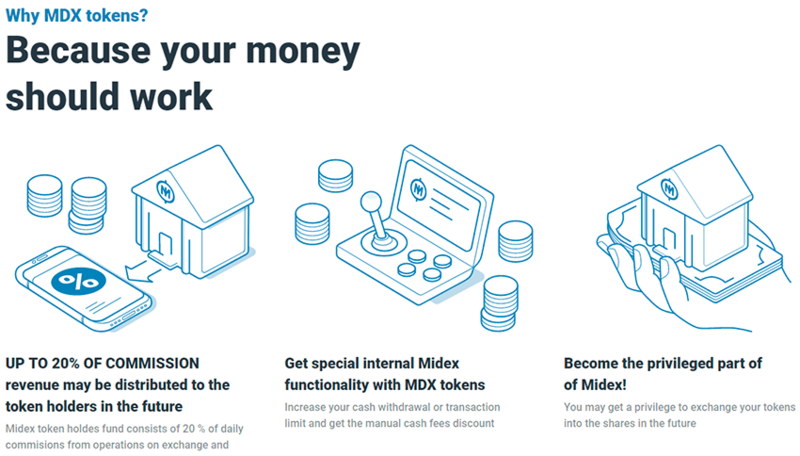 The first service in the world witch gives you the ability to connect other financial service accounts and cryptocurrency exchanges with the subsequent management by them from the Midex account. Full asset management control from one point using private API keys. Clear monitoring of quotations of the world’s cryptocurrency exchanges with customizable notifications of events and an advanced system of technical analysis. Unified cryptocurrency trading center has no analogs in the world and allows you to work with cryptocurrency markets for a single interface. Earn between the difference in exchange rates. Quick exchange of assets between markets, remote order distribution deposit and withdrawal of funds, trade history. On the basis of research done on security systems of the world cryptocurrency market,and on the basis on incident analysis connected with the closing of large trading platforms, Midex has managed to put together a security system with no equals anywhere. It takes into account potential threats of all kinds whitch could compromise the data or lead to theft of funds. Base crypto assets are stored outside of the internet in cold wallets, the keys to which are distributed in several parts and save separately. Daily aggregation wallets are used for current operations, the amount of funds of them is limited by the possible daily needs of the system, and surpluses are sent to cold storage automatically. Blockchain technology is widely used in Midex business processes which makes impossible to substitute or lose financial data. Using Smart contracts makes Midex a reliable and impartial guarantor of fulfilling obligations to users of the system.